This document lists all historical maps either (1) directly accessed from the Culture 4.0 CD-ROM (159 internal images stored as JPG files), or (2) or externally accessed at WWW (internet) sites linked by the program. 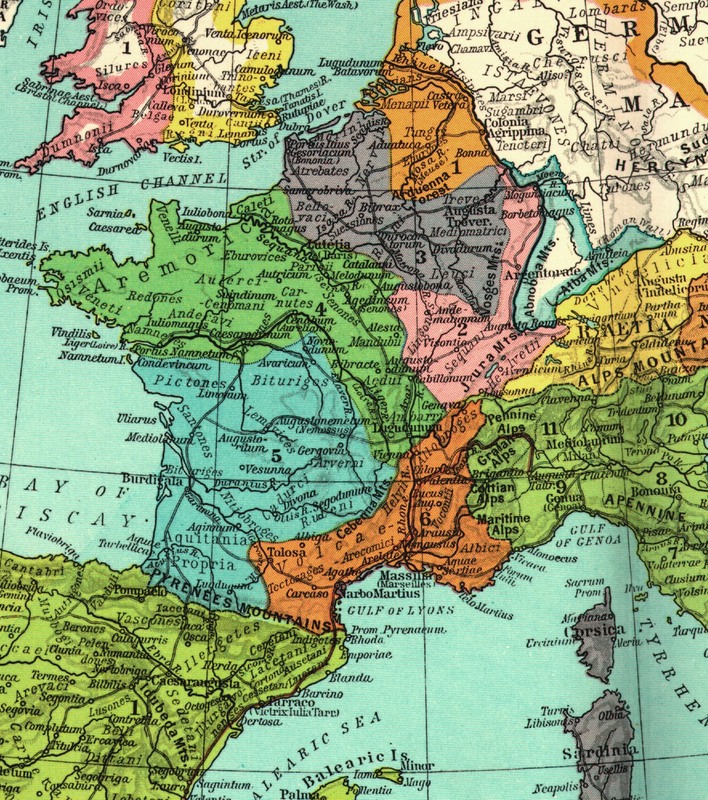 These maps, the bulk of them being scans from early 20th-Century historical atlases, are listed below, both chronologically by era and geographically. While these sources are now public domain, the image scans utilized in Culture 4.0 are copyrighted by CRI. These may be freely used for educational or personal purposes but not for any commercial undertaking without the express written permission of CRI. The Century Atlas of the World, prepared under the Superintendence of Benjamin E. Smith, A.M., Managing Editor of the Century Dictionary, Editor of the Century Cyclopedia of Names, Fellow of the American Geographic Society, Etc. Published by The Century Co., New York, 1900. 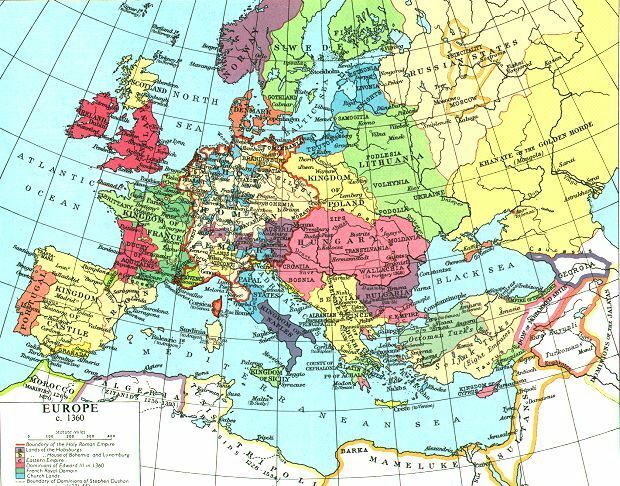 Atlas to the Historical Geography of Europe, by Edward A. Freeman, D.C.L., LL.D., formerly Regius Professor of Modern History in the University of Oxford. Third Edition. Edited by J.B. Bury, M.A., D.Litt., LL,D., Regius Professor of Modern History in the University of Cambridge. Longmans, Green, and Co., 39 Paternoster Row, London, New York and Bombay, 1903. 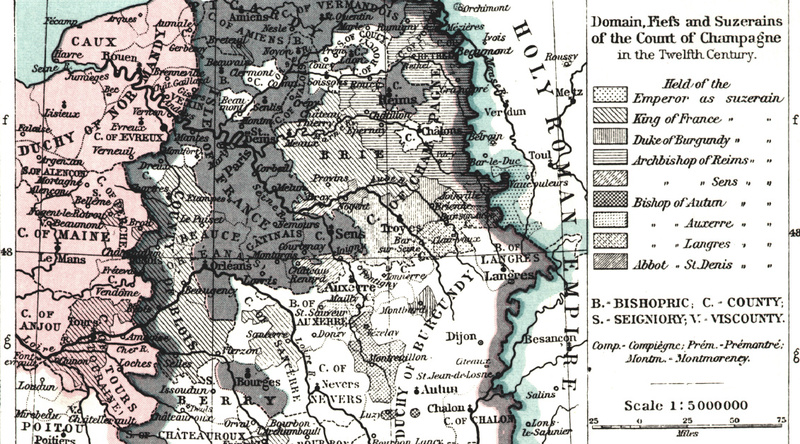 Philips' New Historical Atlas for Students, by Ramsay Muir, M.S., Professor of Modern History in the University of Manchester, George Philip & Son, Ltd., London: The Londond Geographical Institute, 32 Fleet St., E.C., 1911. Oddens Bookmarks -- The mother of all map link lists. Links to Historical Maps on Other Sites (Matthew White) -- An impressive collection from his Historical Atlas of the Twentieth Century. Map History / History of Cartography (Tony Campbell) -- Another interesting collection of links; compiled by the Map Librarian for the British Library. Historical Map Links (Bodleian Library) -- A healthy list. Historical Maps (Yahoo) -- Related links. OSSHE Historical and Cultural Atlas Resource -- An interesting collection of historical maps and related resources from antiquity through early medieval. Maps and Mapping (NM's Creative Impulse) -- Links. Maps and Images (Medieval Sourcebook) -- An excellent medieval archive chiefly stocked with several early 20th-century historical atlases; select links to other sites. Another nice job by Paul Halsall. Periodical Historical Atlas (Christos Nuessli) -- An impressive collection of European maps for each century (1 AD to 1600 AD). The Chaldean, Elamitic and Hittite Powers -- Available on Culture 4.0 CD-ROM. The Egyptian, Assyrian, Babylonian and Median Powers -- Available on Culture 4.0 CD-ROM. Probable Route of the Exodus -- Available on Culture 4.0 CD-ROM. Canaan as Divided Between the Twelve Tribes -- Available on Culture 4.0 CD-ROM. Israel, c.1000 B.C. -- Available on Culture 4.0 CD-ROM. Biblical Maps (Matthew White) -- Links. Ancient Jerusalem (utexas) -- (356K). Ancient Asia Minor (utexas) -- (638K). The Ancient Near East (K.C. Hanson) -- (141K). Political Change in Ancient Mesopotamia 3000-1000 BCE -- Requires Shockwave plug-in. Homeric Greece and Neighboring Lands -- Available on Culture 4.0 CD-ROM. Greece and the Greek Colonies -- Available on Culture 4.0 CD-ROM. Greece in the 5th Century B.C. Ancient Greece and Asia Minor -- Available on Culture 4.0 CD-ROM. The Persian Empire (c.500 B.C.) and the Empire of Alexander the Great (323 B.C.) -- Available on Culture 4.0 CD-ROM. Dominions of Alexander c.323 B.C. -- Available on Culture 4.0 CD-ROM. Successors of Alexander c.300 B.C. -- Available on Culture 4.0 CD-ROM. Aegean Lands c.227 B.C. -- Available on Culture 4.0 CD-ROM. Cultural Map of Hellas (Hellenic Ministry of Culture) -- This multi-level collection of maps provides detailed information about various cultural sites and institutions throughout Greece. Well done. Map of Greece & Western Asia Minor (Carlos Parada's Greek Mythology Link) -- Includes inter-archival links. Greek Maps (Matthew White) -- Links. Map of Greece (Aegean Web Server) -- Another collection of clickable maps with detailed travel and related info for each region. Perseus' Ancient Mediterranean World Atlas -- The Perseus Project Atlas enables the user to construct their own maps of select regions. Map of Crete (Dilos) -- Detailed contemporary travel maps in clickable format. Maps of Peloponnese (Dilos) -- Detailed contemporary travel maps in clickable format. Hellenistic world c. 188 BC. Alexander's Campaigns (WWU) -- Animated and in color. Ptolemaic and Seleucid Empires in 240 B.C. (ect Zeugma) -- Color with annotation. Greeks & Phoenicians: Colonization in the 9-6 Cent. BCE -- Requires Shockwave plug-in. March of the 10,000: 401-398 BCE -- Requires Shockwave plug-in (254K). Macedonian Expansion under Philip & Alexander -- Requires Shockwave plug-in. Pre-Roman Italy -- Available on Culture 4.0 CD-ROM. Ancient Italy -- Available on Culture 4.0 CD-ROM. Mediterranean Lands at the beginning of the Second Punic War -- Available on Culture 4.0 CD-ROM. Ancient Rome -- Available on Culture 4.0 CD-ROM. Roman Dominions, 64 B.C. -- Available on Culture 4.0 CD-ROM. The Roman Empire at the Death of Augustus, 13 A.D. -- Available on Culture 4.0 CD-ROM. The Roman Empire Divided into Prefectures -- Available on Culture 4.0 CD-ROM. Britannia, c.350 -- Available on Culture 4.0 CD-ROM. Roman Atlas (LacusCurtius) -- A large collection of maps with search capabilities. Roman Maps (Matthew White) -- Links. The Roman Empire at its Greatest Extent (John Vanderspoel) -- "This map of the Roman Empire was scanned from pages 16 & 17 of a 1925 reprint of the 1907 Atlas of Ancient and Classical Geography... Clicking anywhere on this map will give you a more detailed look at that portion of the Roman Empire; as a guideline, the map above is divided into nine relatively equal segments." In color and nicely done -- note: the first detailed maps can be clicked to access a second more detailed set of images. Maps of the Roman Empire (Dalton School) -- A lengthy list of links to Roman maps at various websites as well as the two noted below. 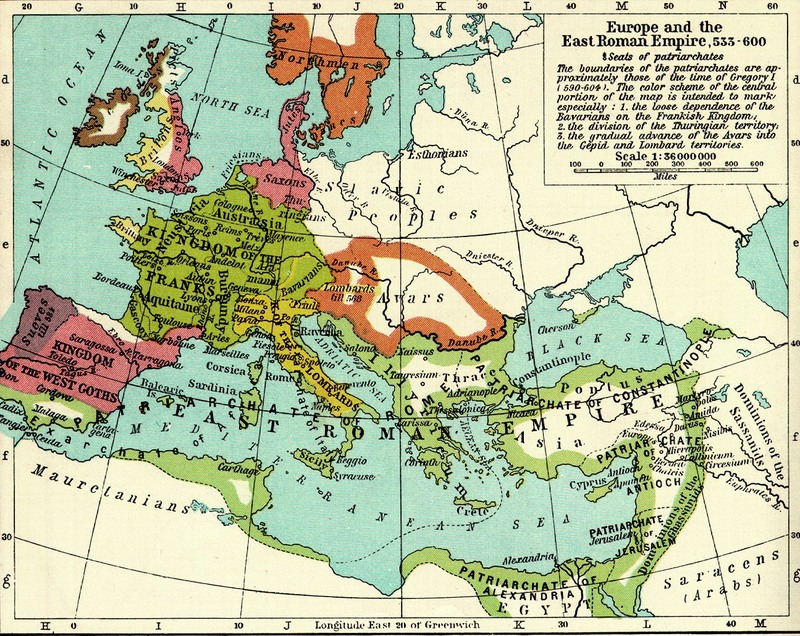 Trade Routes and Major Empires of the First Century (Dalton School) -- In color. 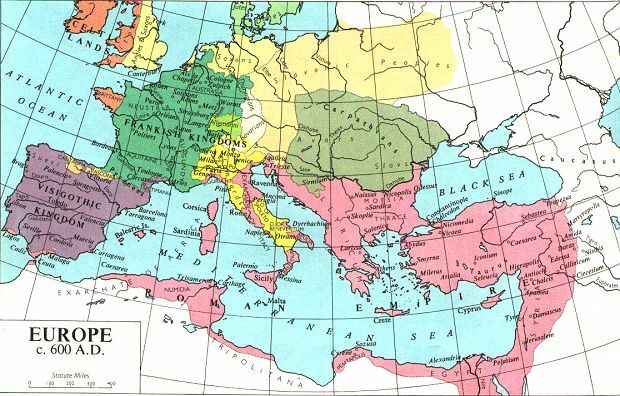 Roman Empire c.120 A.D. (Dalton School) -- This amazing map shows the major provinces of the Roman Empire. Clicking on a particular prvince leads you to a separate page with links to related web sites and other data. Very well done. Maps of Rome (Gary Brueggeman) -- An interesting collection. Map of the Roman Empire (David Camden) -- Nicely done, in color. The Spread of Christianity to 180 A.D. (upenn) -- From Adolf Harnack, The Mission and Expansion of Christianity in the First Three Centuries, 1908. Roman Empire Expansion -- Requires Shockwave plug-in. Second Punic War -- Requires Shockwave plug-in. Roman Italy: Urbanization & Road Building -- Requires Shockwave plug-in. Roman World: Citizen communities outside the Italian homeland -- Requires Shockwave plug-in. 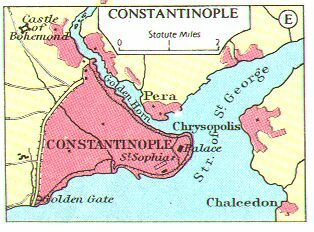 Spread of Christianity: 2nd-4th Cent. CE -- Requires Shockwave plug-in. 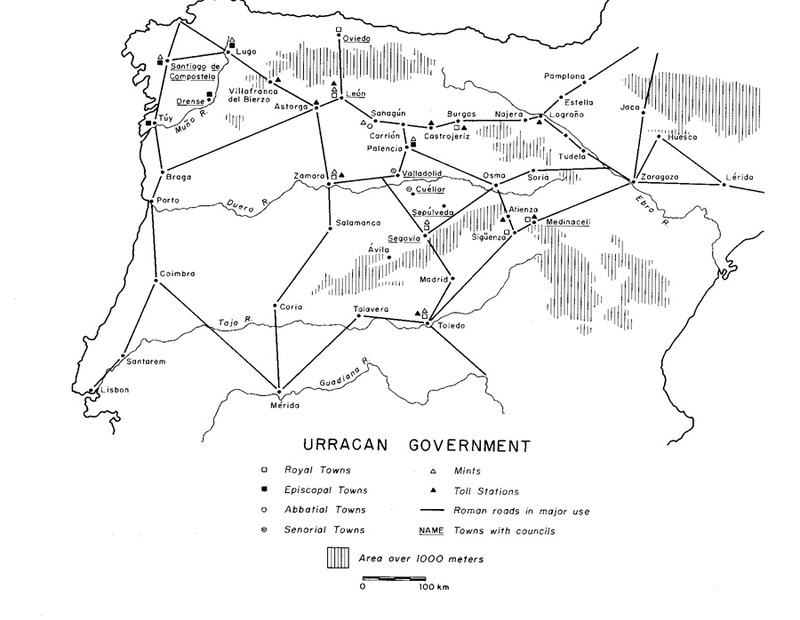 Roman World: Urbanization of Gaul -- Requires Shockwave plug-in. Roman Frontier -- Requires Shockwave plug-in. Britannia, Roman British Islands (utexas) -- Color map (663K). The Eastern Empire c.395 (fordham) -- Adapted from Muir's Historical Atlas (1911). Medieval Maps (Matthew White) -- Links. Europe c.476 A.D. -- Available on Culture 4.0 CD-ROM. 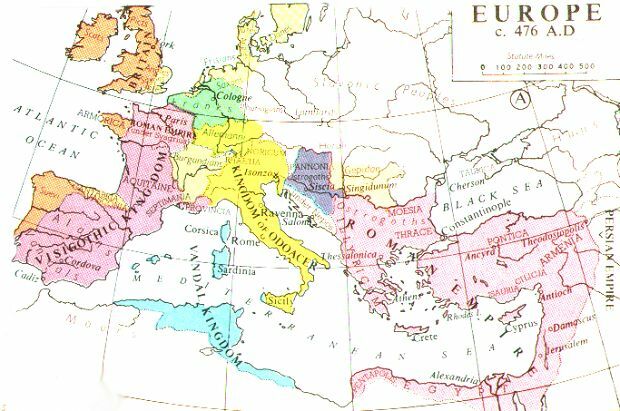 Europe in the Reign of Theodoric, c.500 A.D. -- Available on Culture 4.0 CD-ROM. Europe c.520 A.D. -- Available on Culture 4.0 CD-ROM. 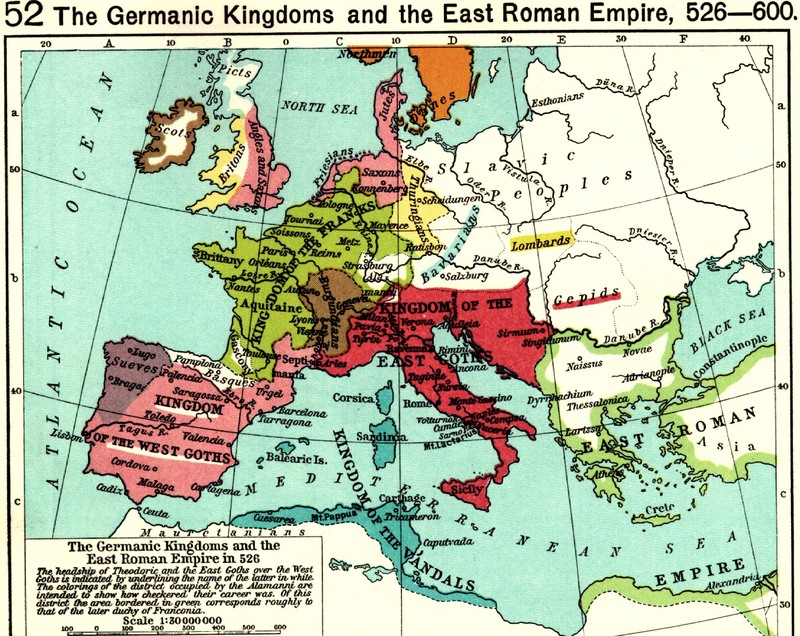 Europe at the Death of Justinian, 565 A.D. -- Available on Culture 4.0 CD-ROM. English Conquest from 450 to the End of the Sixth Century -- Available on Culture 4.0 CD-ROM. 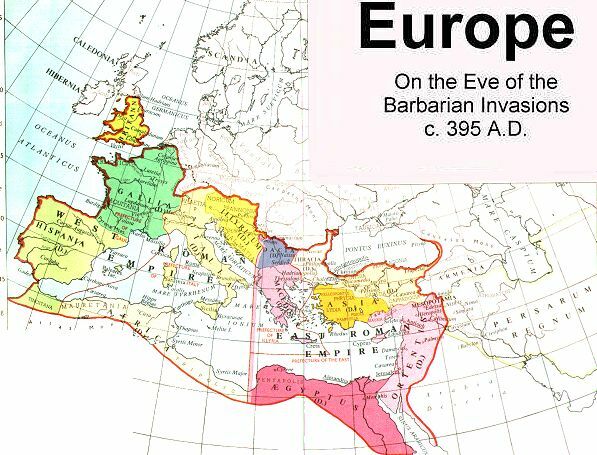 Europe c.600 A.D. -- Available on Culture 4.0 CD-ROM. Italy, c.600 -- Available on Culture 4.0 CD-ROM. The English Conquest of Britain, 550-800 -- Available on Culture 4.0 CD-ROM. British Isles and their Teutonic Invadors (4th-9th Centuries) -- Available on Culture 4.0 CD-ROM. Barbarian Migrations in Late Antiquity (OSSHE)-- Requires Shockwave plug-in. 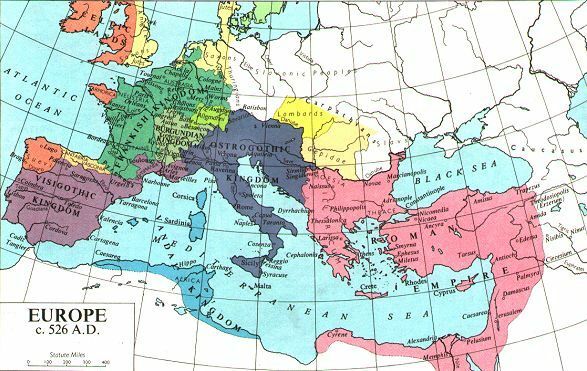 Central Italy, with the adjacent countries, from the Peutingerian Tables constructed about 393 A.D. (utexas) -- (580K) From A Classical Atlas by Alexander G. Findlay. New York: Harper and Brothers 1849. "Adaptations from Muir's Historical Atlas: (1911)." Barbarian Migrations in Late Antiquity -- Requires Shockwave plug-in. 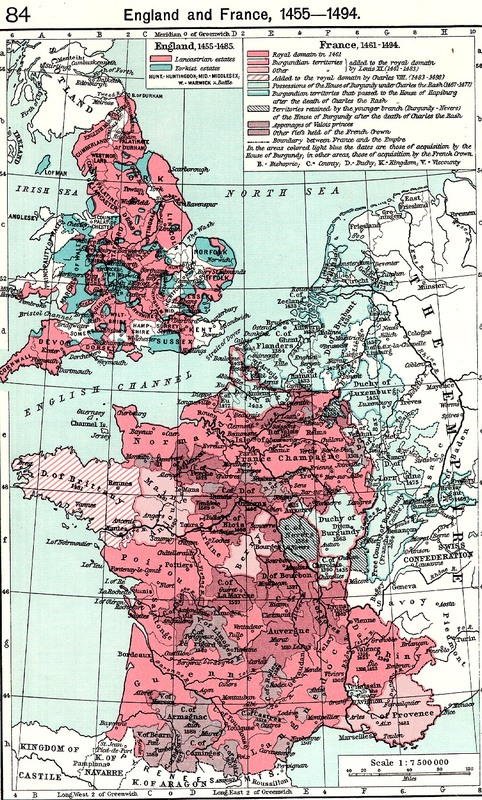 Atlas historique de l'Antiquité tardive -- A collection of maps providing an overview of the Roman Empire for the years 380-540 A.D. (French text only). Barbarian Invasions (HyperHistory) -- Interactive world map with contextual links. Europe c.600 -- Available on Culture 4.0 CD-ROM. Europe, 695 -- Available on Culture 4.0 CD-ROM. 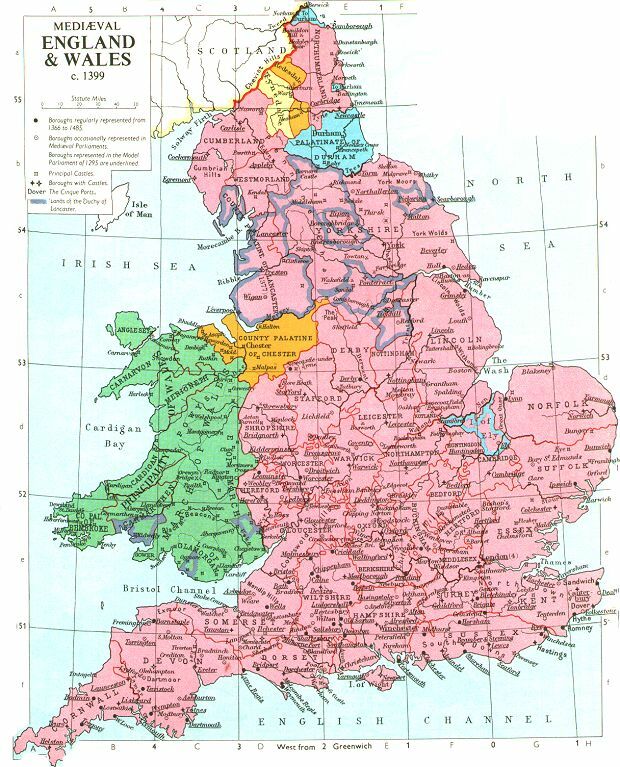 England in the 8th Century (The Heptarchy) -- Available on Culture 4.0 CD-ROM. England in the 8th Century -- Available on Culture 4.0 CD-ROM. Europe c.800 -- Available on Culture 4.0 CD-ROM. Expansion of Islam: 600-1132 (HyperHistory) -- Interactive world map with contextual links. Maps at upenn -- From W.C. Brice. An Historical Atlas of Islam (Leiden, 1981). Central Europe, 843 -- Available on Culture 4.0 CD-ROM. Central Europe, 870 -- Available on Culture 4.0 CD-ROM. England at the Treaty of Wedmore, 878 -- Available on Culture 4.0 CD-ROM. Central Europe, 887 -- Available on Culture 4.0 CD-ROM. South Eastern Europe, 910 -- Available on Culture 4.0 CD-ROM. Germany, c.962 -- Available on Culture 4.0 CD-ROM. Central Europe, 980 -- Available on Culture 4.0 CD-ROM. France and Burgundy, 987 -- Available on Culture 4.0 CD-ROM. South Eastern Europe, 1000 -- Available on Culture 4.0 CD-ROM. Baltic Lands, 1000 -- Available on Culture 4.0 CD-ROM. 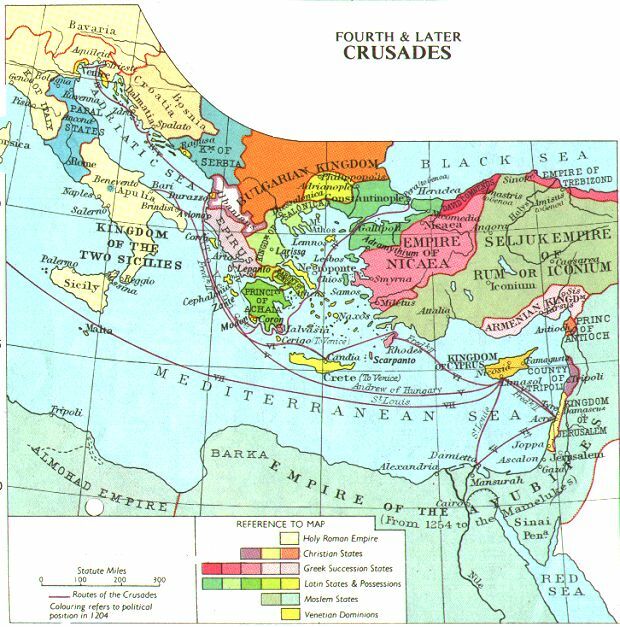 Greatest Extent of the Saracen (Muslim) Dominions -- Available on Culture 4.0 CD-ROM. 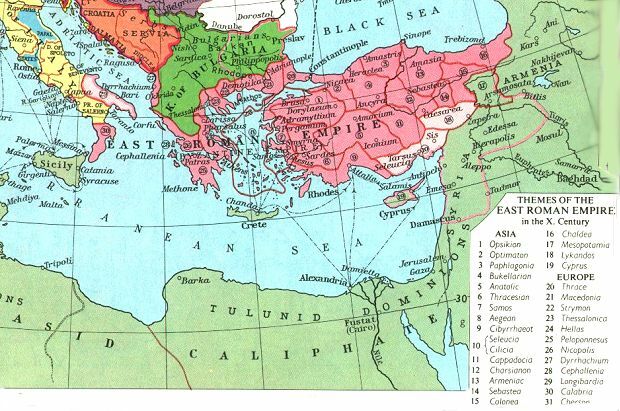 The Late Abbasid Caliphate c.900 (upenn) -- From W.C. Brice. An Historical Atlas of Islam (Leiden, 1981). 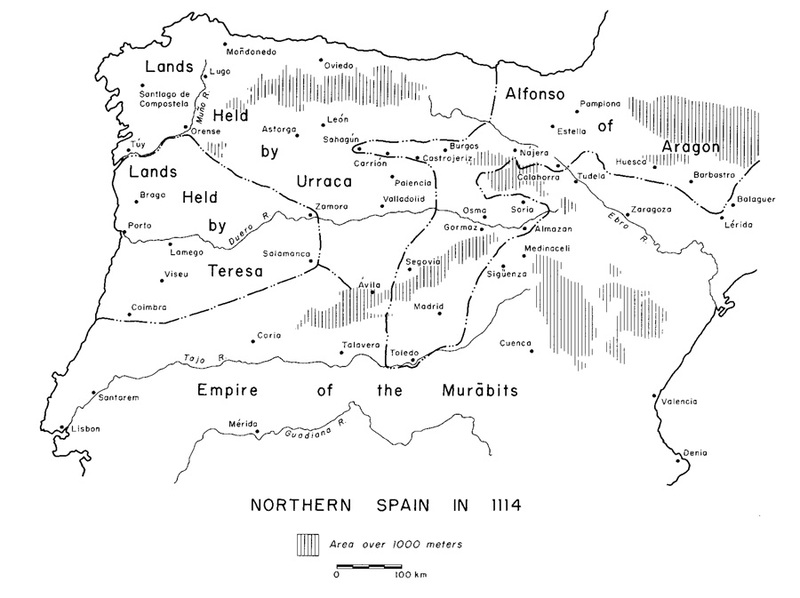 The Umayyad Caliphate (Spain) in the 2nd Half of the 9th & the 2nd Half of the 10th Centuries (upenn) -- From W.C. Brice. An Historical Atlas of Islam (Leiden, 1981). European Map Collection at University of Texas (Atlas To Freeman's Historical Geography, 1903). The Anglo-Saxon Kingdoms of England -- From a thesis by Erich J. Richter. 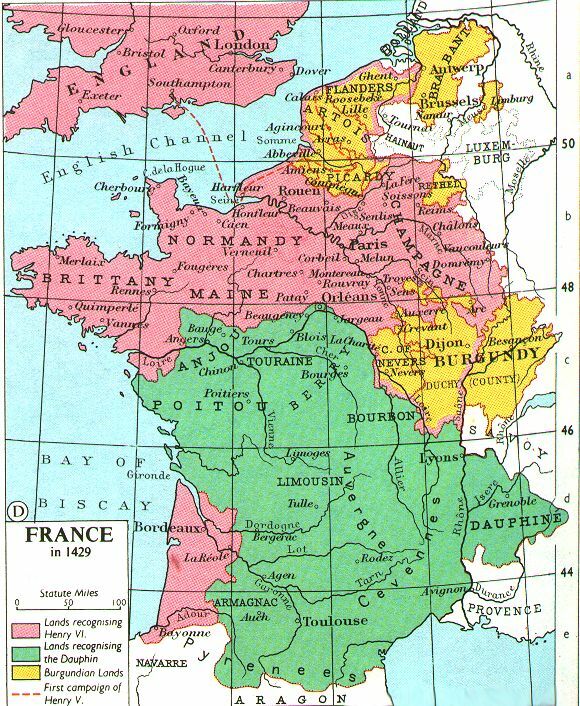 Frankish Empire (HyperHistory) -- Interactive map with contextual links. The Byzantine Theme System (fordham) -- Adapted from Muir's Historical Atlas (1911). Spanish Kingdoms, 1030 -- Available on Culture 4.0 CD-ROM. 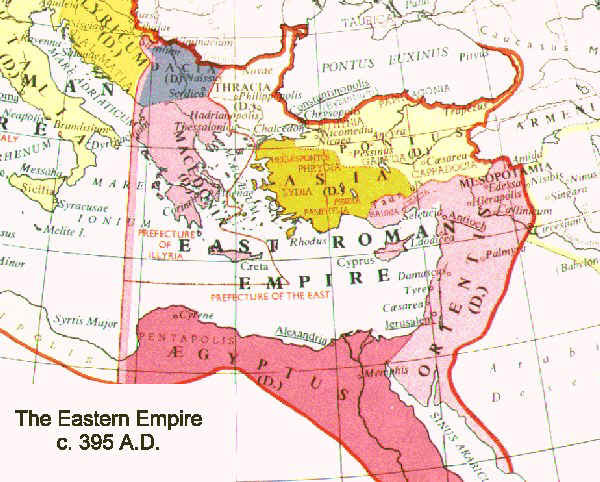 South Eastern Europe, 1040-1070 -- Available on Culture 4.0 CD-ROM. England and Her Invaders in the 11th Century -- Available on Culture 4.0 CD-ROM. England on the Eve of the Norman Conquest, c.1060 -- Available on Culture 4.0 CD-ROM. 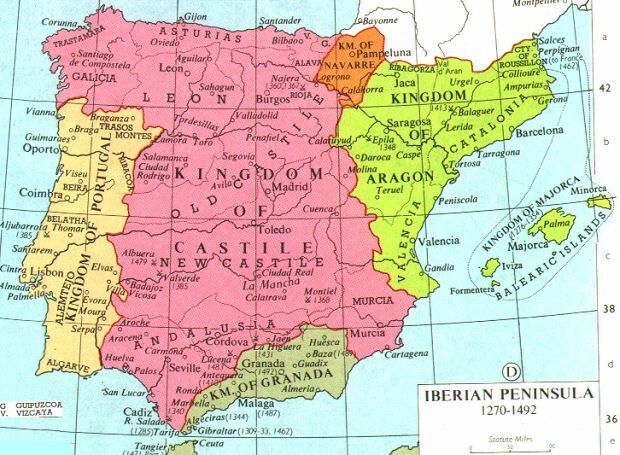 The Iberian Peninsula at the Beginning of the 12th Century -- Available on Culture 4.0 CD-ROM. Germany in the 12th Century -- Available on Culture 4.0 CD-ROM. 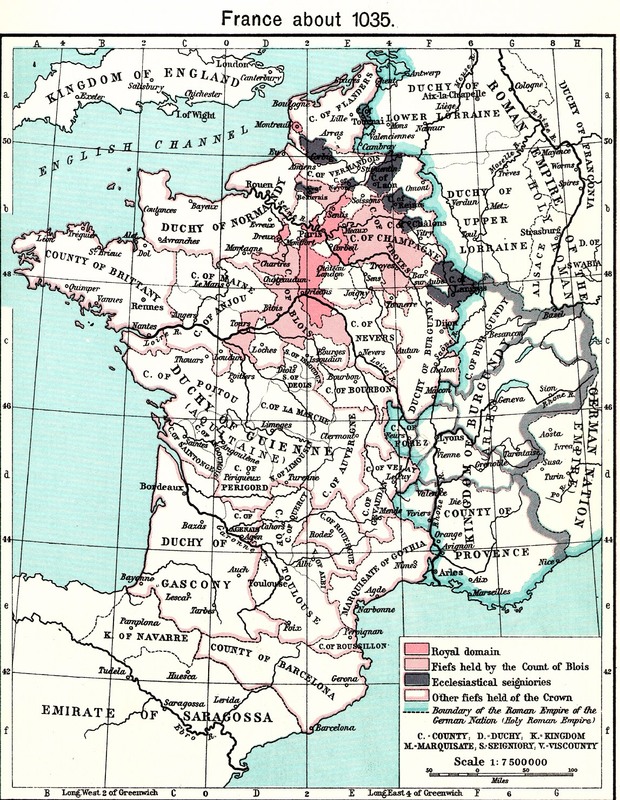 Growth of the French Monarchy (1100-1337) -- Available on Culture 4.0 CD-ROM. South Eastern Europe, 1105 -- Available on Culture 4.0 CD-ROM. Selections from Maps and Images (Medieval Sourcebook) -- "Adaptations from Muir's Historical Atlas: (1911)." Europe, 1099 -- Interactive map with links to details. 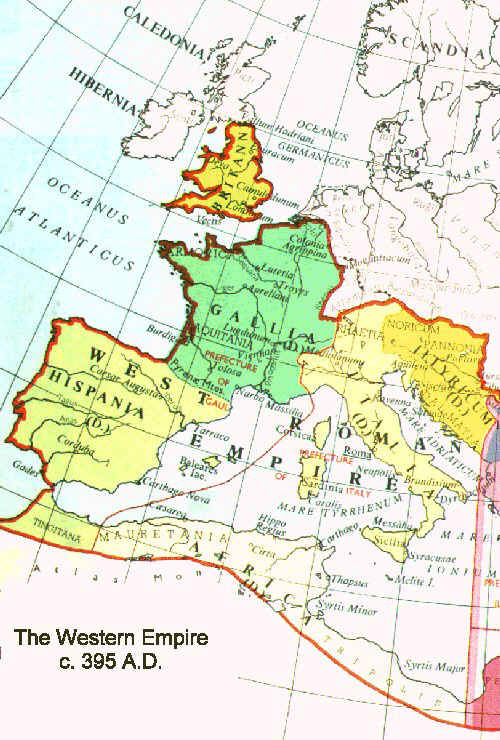 Norman territories in Britain and Europe -- From a thesis by Erich J. Richter. 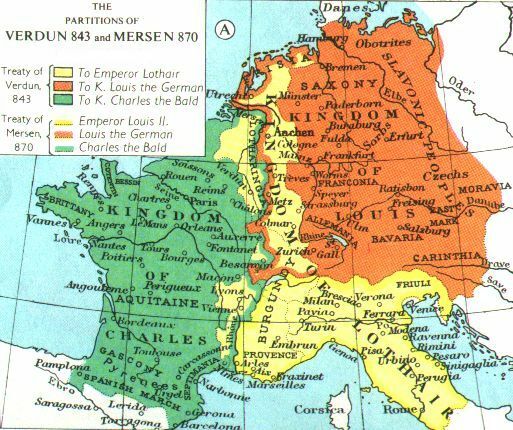 Normandy and England in 1066, pre-Conquest -- From a thesis by Erich J. Richter. 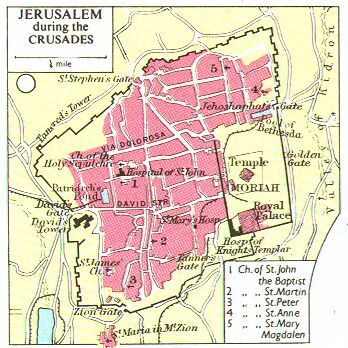 The First Crusade, 1099 (Medieval Sourcebook) -- Interactive map with links to details; adaptation from Muir's Historical Atlas (1911). Nicely done. England under the Normans, 1066-1100 -- From a thesis by Erich J. Richter. Central Europe, 1180 -- Available on Culture 4.0 CD-ROM. 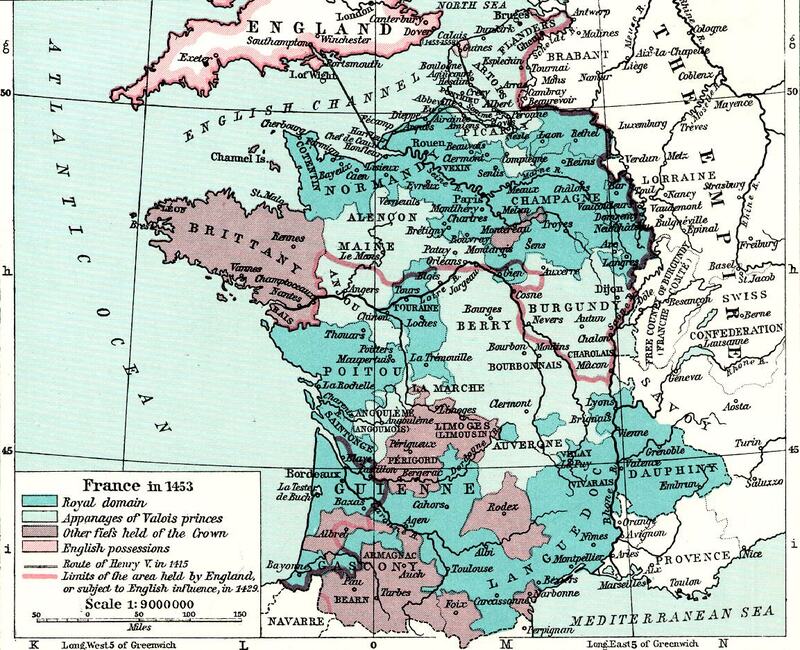 English Possessions in France, c.1180 -- Available on Culture 4.0 CD-ROM. 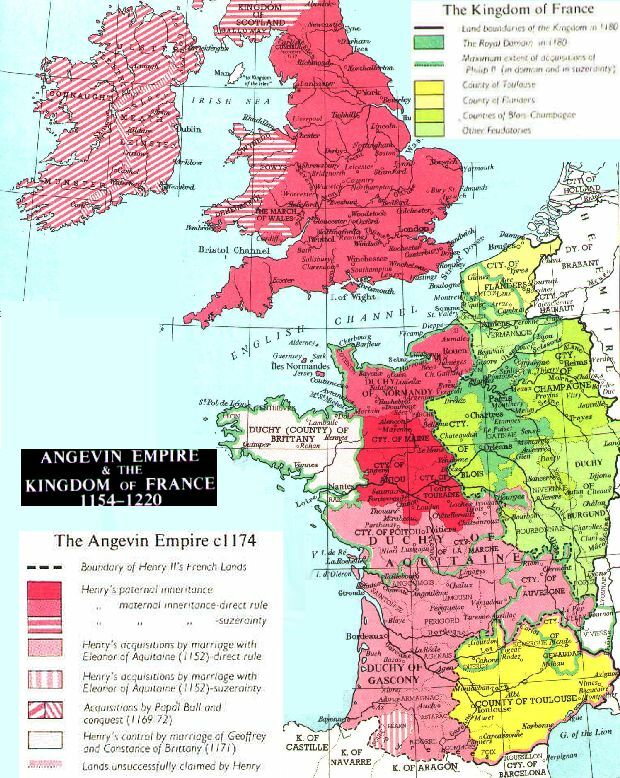 The Angevain Empire, c.1180 -- Available on Culture 4.0 CD-ROM. South Eastern Europe, 1180 -- Available on Culture 4.0 CD-ROM. Spanish Kingdoms, 1210 -- Available on Culture 4.0 CD-ROM. South Eastern Europe, 1210 -- Available on Culture 4.0 CD-ROM. Baltic Lands, 1220 -- Available on Culture 4.0 CD-ROM. 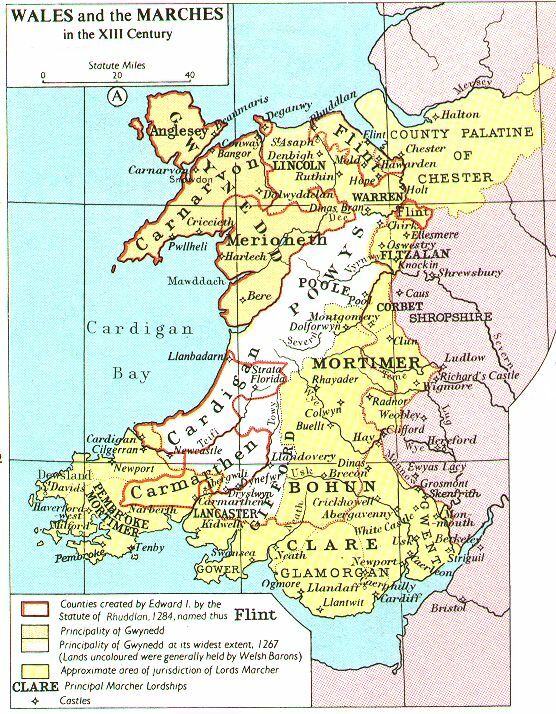 Wales and the Scottish Borders in the 13th Century -- Available on Culture 4.0 CD-ROM. 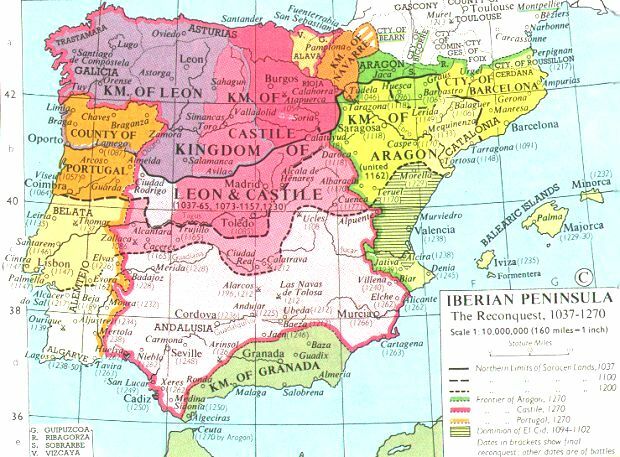 The Iberian Peninsula from 1257 to 1492 -- Available on Culture 4.0 CD-ROM. Baltic Lands, 1270 -- Available on Culture 4.0 CD-ROM. Asia under the Mongols, Eastern Sheet -- Available on Culture 4.0 CD-ROM. 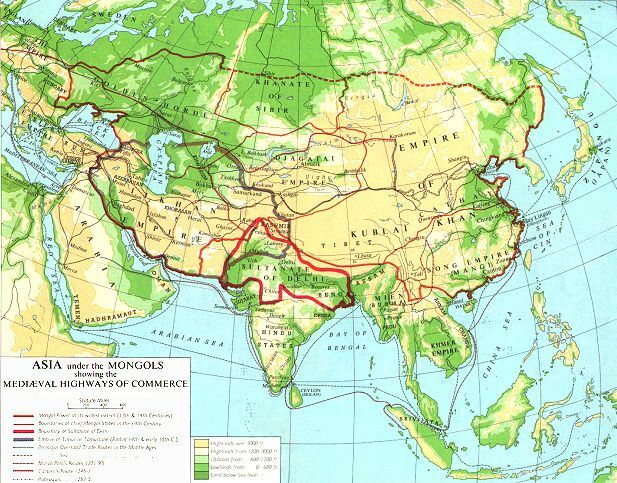 Asia under the Mongols, Western Sheet -- Available on Culture 4.0 CD-ROM. The Muslim World c.A.D. 1300 (upenn) -- From W.C. Brice. An Historical Atlas of Islam (Leiden, 1981). Hereford Map, produced around A.D. 1300 (Virginia Military Academy) -- The oldest surviving medieval map from England -- shown here in black and white (720K). Mongol Empires (HyperHistory) -- Interactive world map with contextual links. 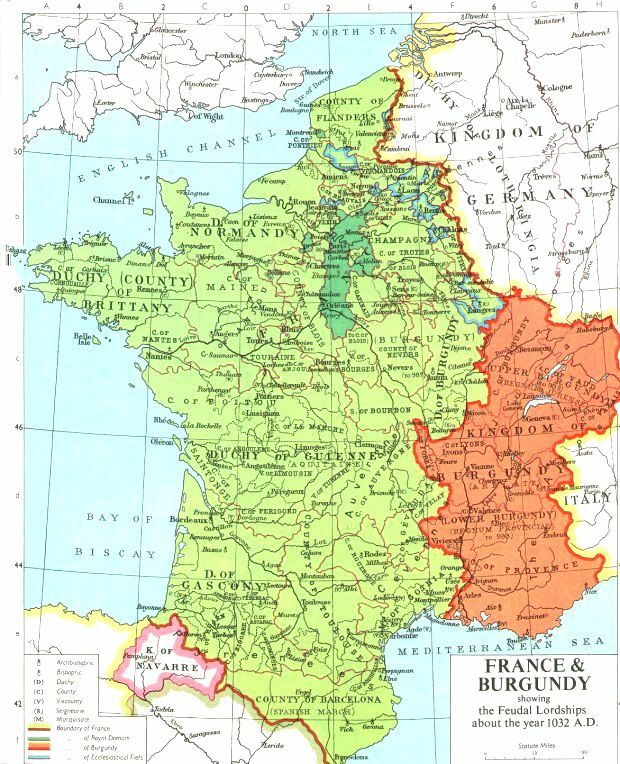 France at the Death of Philip IV, 1314 -- Available on Culture 4.0 CD-ROM. South Eastern Europe, 1340 -- Available on Culture 4.0 CD-ROM. Baltic Lands, 1350-1360 -- Available on Culture 4.0 CD-ROM. 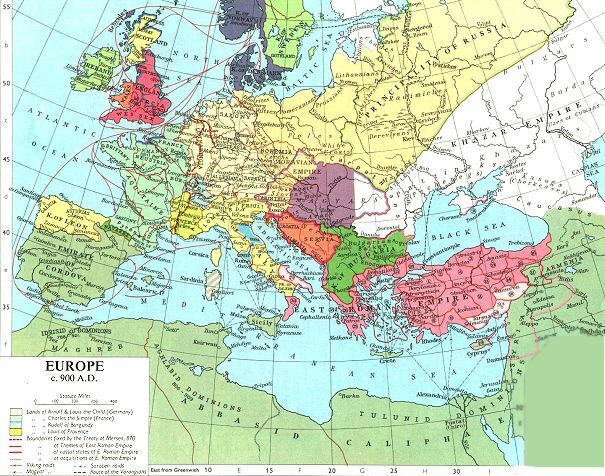 South Eastern Europe, 1354-1358 -- Available on Culture 4.0 CD-ROM. France, 1360 -- Available on Culture 4.0 CD-ROM. 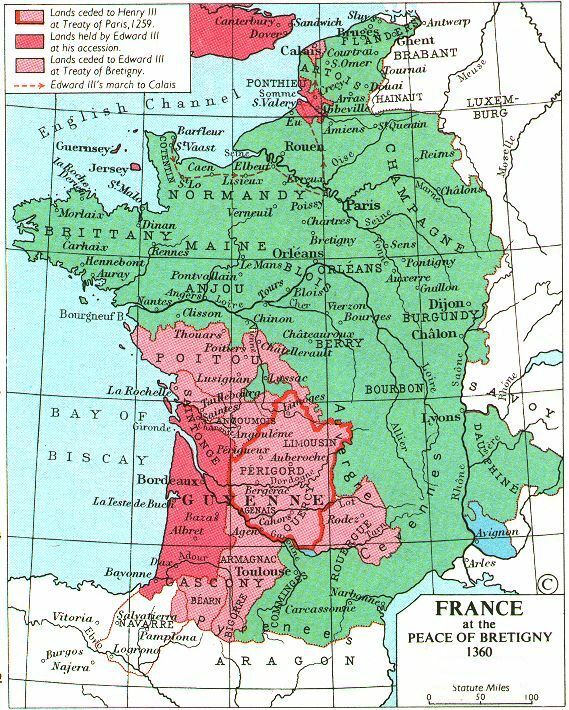 France at the Peace of Bretigny, 1360 -- Available on Culture 4.0 CD-ROM. Spanish Kingdoms, 1360 -- Available on Culture 4.0 CD-ROM. Central Europe, 1360 -- Available on Culture 4.0 CD-ROM. Baltic Lands, 1400 -- Available on Culture 4.0 CD-ROM. Growth of the Ottoman Empire, 1307-1683 -- Available on Culture 4.0 CD-ROM. 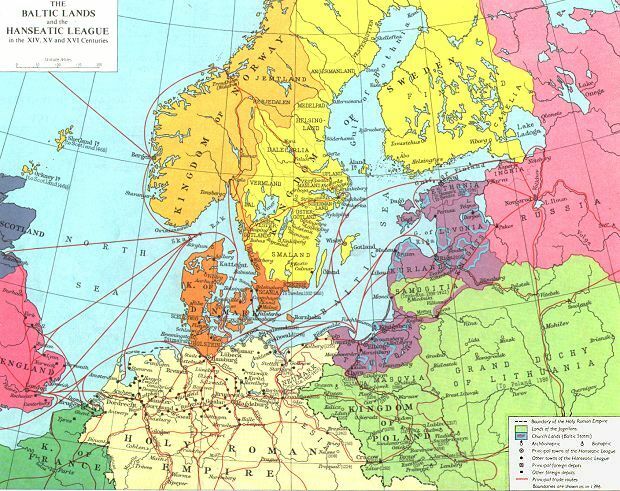 The Hanseatic League: 14th-16th Centuries (Medieval Sourcebook) -- Map from Muir's Historical Atlas (1911). 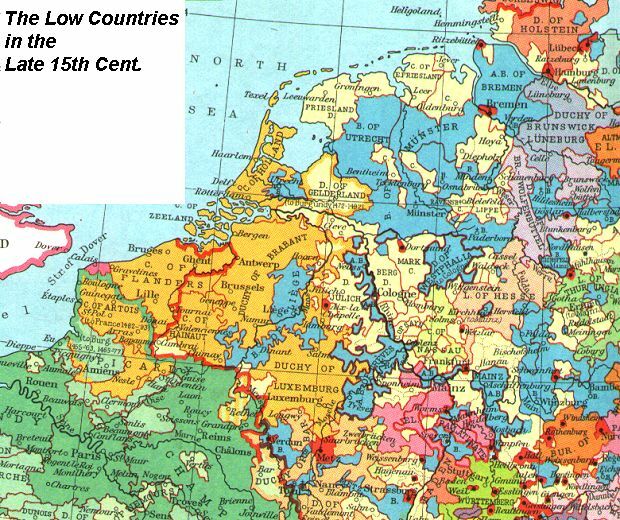 The Netherlands in the Late Middle Ages and 17th Century -- Available on Culture 4.0 CD-ROM. South Eastern Europe, 1401 -- Available on Culture 4.0 CD-ROM. France at the Death of Henry V, 1422 -- Available on Culture 4.0 CD-ROM. France, 1429 -- Available on Culture 4.0 CD-ROM. South Eastern Europe, 1444 -- Available on Culture 4.0 CD-ROM. Central Europe, 1460 -- Available on Culture 4.0 CD-ROM. 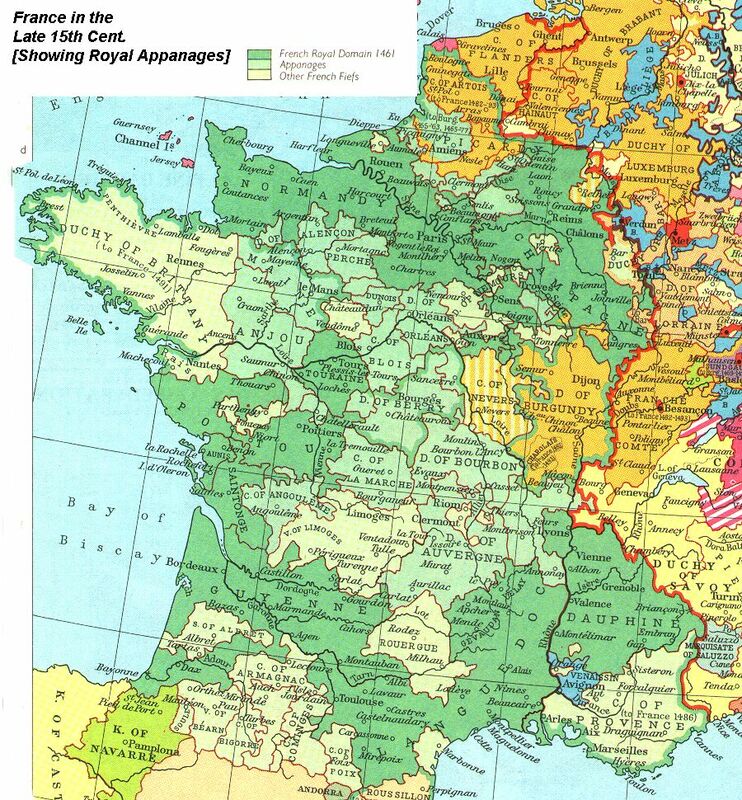 France, 1461-1595 -- Available on Culture 4.0 CD-ROM. South Eastern Europe, 1464 -- Available on Culture 4.0 CD-ROM. Baltic Lands, 1478 -- Available on Culture 4.0 CD-ROM. 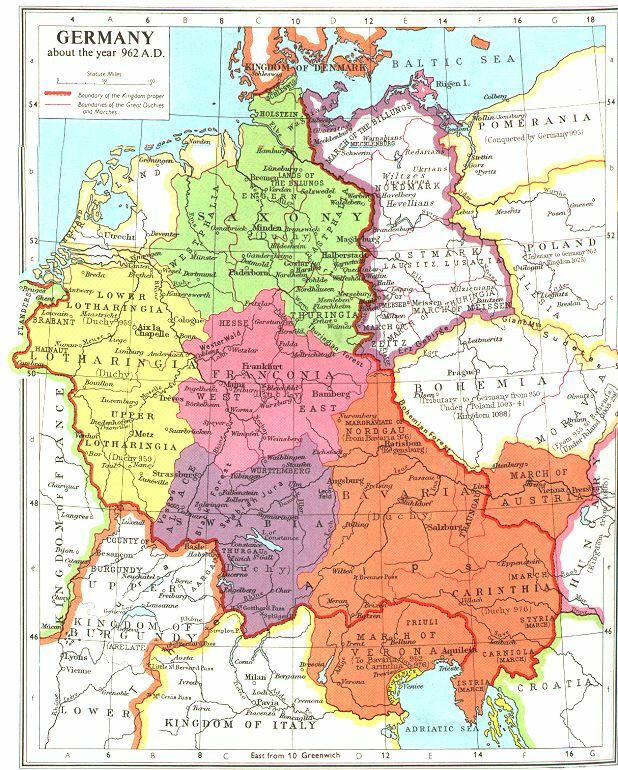 Germany at the End of the 15th Century -- Available on Culture 4.0 CD-ROM. Europe, 1519 -- Available on Culture 4.0 CD-ROM. Eccesiatical England in the Time of Henry VIII -- Available on Culture 4.0 CD-ROM. 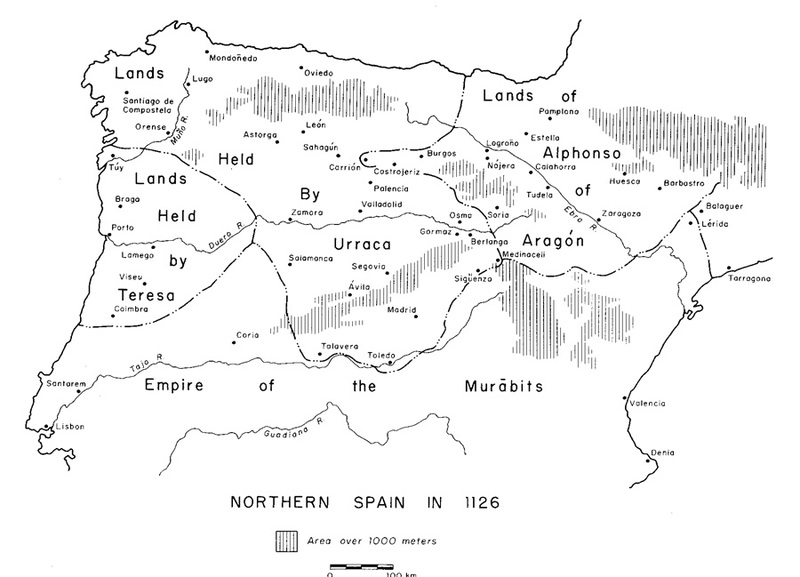 Spanish Kingdoms under Charles V, c.1550 -- Available on Culture 4.0 CD-ROM. Baltic Lands, 1563 -- Available on Culture 4.0 CD-ROM. Reformation Europe -- Available on Culture 4.0 CD-ROM. 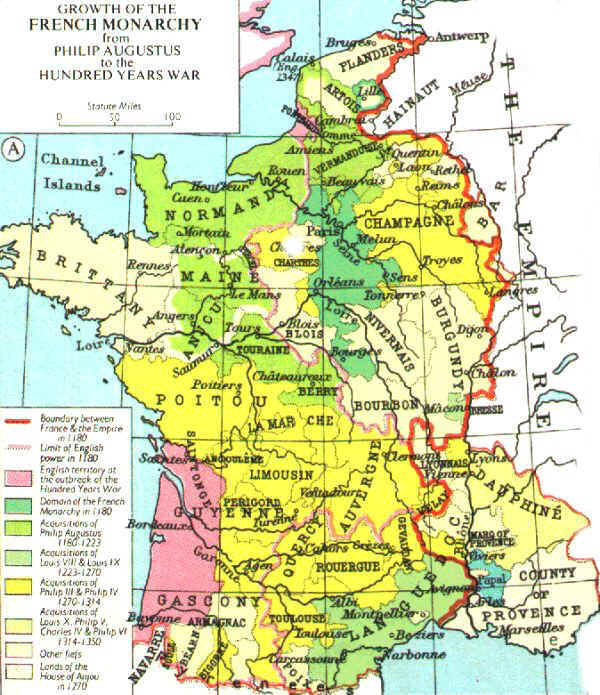 Boundary of France, 1555-1871 -- Available on Culture 4.0 CD-ROM. Selections from the Map Collection at University of Texas (Atlas To Freeman's Historical Geography, 1903). The Muslim World c.A.D. 1500 (upenn) -- From W.C. Brice. An Historical Atlas of Islam (Leiden, 1981). 1500-1800 (HyperHistory) -- Interactive world map with contextual links. British Colonial Grants, 1606-1620 -- Available on Culture 4.0 CD-ROM. Baltic Lands, 1617 -- Available on Culture 4.0 CD-ROM. England during the Civil War, 1643 -- Available on Culture 4.0 CD-ROM. 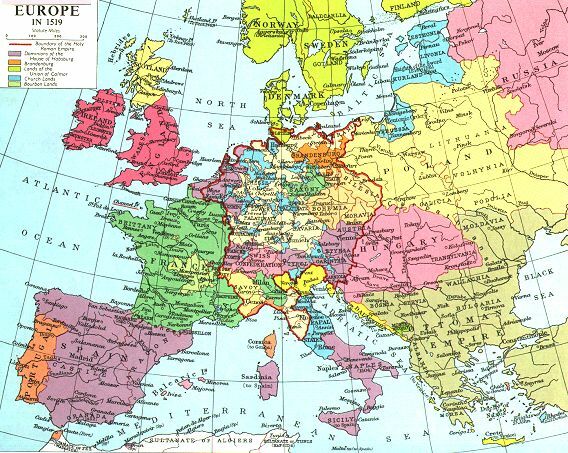 Europe at the Peace of Westphalia, 1648 -- Available on Culture 4.0 CD-ROM. The Colonization of America, c.1650 -- Available on Culture 4.0 CD-ROM. South America in 1650 and the 19th Century -- Available on Culture 4.0 CD-ROM. European Settlements in the West Indies and Central America -- Available on Culture 4.0 CD-ROM. Central Europe, 1660 -- Available on Culture 4.0 CD-ROM. Poland, 1667 -- Available on Culture 4.0 CD-ROM. Middle Eastern Europe in 1667 -- Available on Culture 4.0 CD-ROM. South Eastern Europe, 1672 -- Available on Culture 4.0 CD-ROM. British Colonial Grants, 1620-1681 -- Available on Culture 4.0 CD-ROM. Baltic Lands, 1701 -- Available on Culture 4.0 CD-ROM. South Eastern Europe, 1727 -- Available on Culture 4.0 CD-ROM. Europe, 1740 -- Available on Culture 4.0 CD-ROM. Janssonius map of the Netherlands 1658 (George M. Welling) -- This map is a selection from the site noted above. 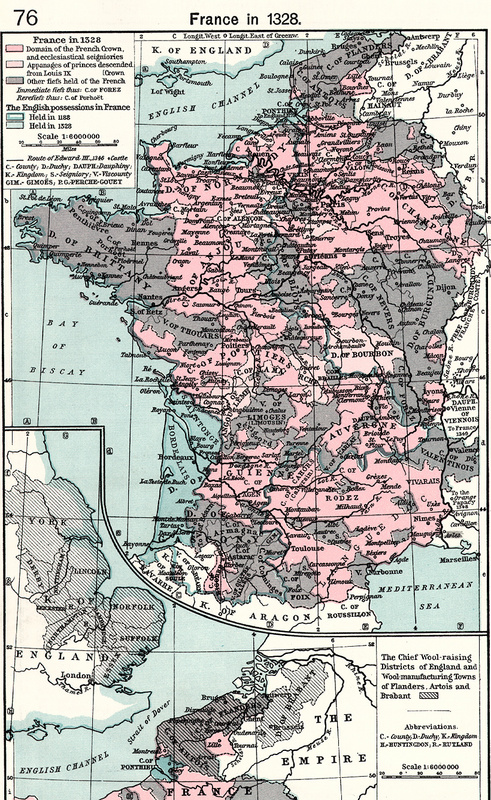 In color with details of modern provinces. Map Collection (Amsterdam University Library) -- Text in Dutch. 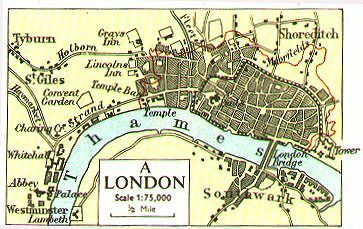 London, c.1630 (NYPL) -- Image and commentary. North America, 1750-1783 -- Available on Culture 4.0 CD-ROM. French and Indian War, 1756-1762 -- Available on Culture 4.0 CD-ROM. India: 1756-1784 and 1805 -- Available on Culture 4.0 CD-ROM. Poland, 1772 -- Available on Culture 4.0 CD-ROM. Baltic Lands, 1772 -- Available on Culture 4.0 CD-ROM. United States, 1783 -- Available on Culture 4.0 CD-ROM. America during the War of Independence and Civil War -- Available on Culture 4.0 CD-ROM. Slavery in the United States, 1775-1865 -- Available on Culture 4.0 CD-ROM. Poland, 1793 -- Available on Culture 4.0 CD-ROM. Poland, 1795 -- Available on Culture 4.0 CD-ROM. Baltic Lands, 1795 -- Available on Culture 4.0 CD-ROM. Middle Eastern Europe in 1795 -- Available on Culture 4.0 CD-ROM. 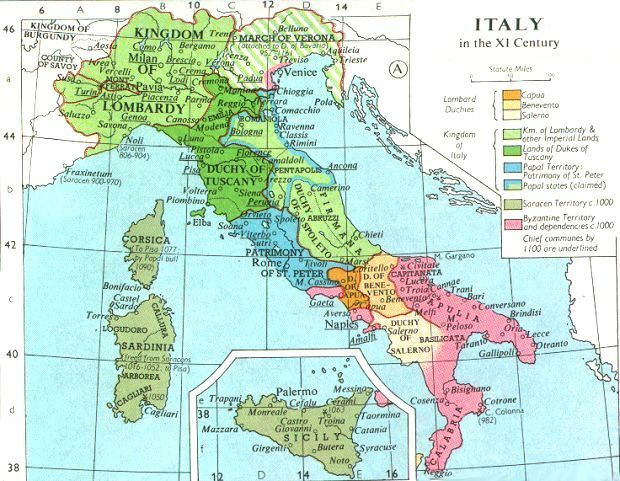 Italy in the XVII and XVIII Centuries -- Available on Culture 4.0 CD-ROM. Central Europe, 1801 -- Available on Culture 4.0 CD-ROM. John Mitchell's Map, 1750-1755 (U. of Southern Maine) -- "The Mitchell Map has been described, and rightly so, as the most important map in North American history. The most comprehensive map of North America produced during the Colonial Era, it represented the various territorial claims made by not only the competing British and French empires but also by the various British colonies. It has accordingly served, as recently as 1932, in legal disputes between eastern states. More importantly, it was the map on which the boundaries of the new United States were defined by American and British negotiators in Paris in 1782-83; in that capacity, it has continued to be of importance right up to the 1980s US-Canadian dispute over the Gulf of Maine fisheries." United States of America 1800 (Bodleian Library) -- Anonymous color map. Selections from the European Map Collection at University of Texas (Atlas To Freeman's Historical Geography, 1903). Napoleonic Battles (1805-1815) -- Available on Culture 4.0 CD-ROM. 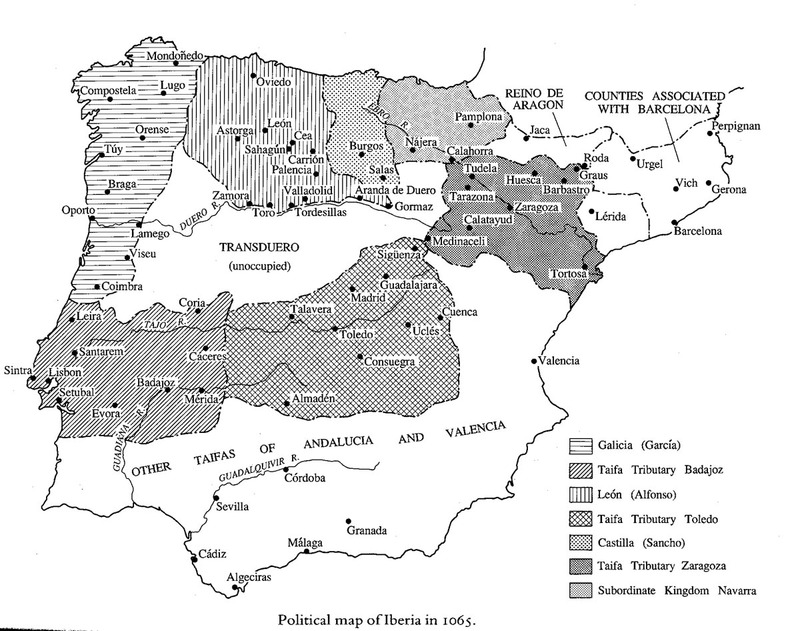 The Iberian Peninsula during the Peninsular War (1808-1814) -- Available on Culture 4.0 CD-ROM. Baltic Lands, 1809 -- Available on Culture 4.0 CD-ROM. Europe, 1810 -- Available on Culture 4.0 CD-ROM. Central Europe, 1810 -- Available on Culture 4.0 CD-ROM. Europe, 1815 -- Available on Culture 4.0 CD-ROM. Central Europe, 1815 -- Available on Culture 4.0 CD-ROM. 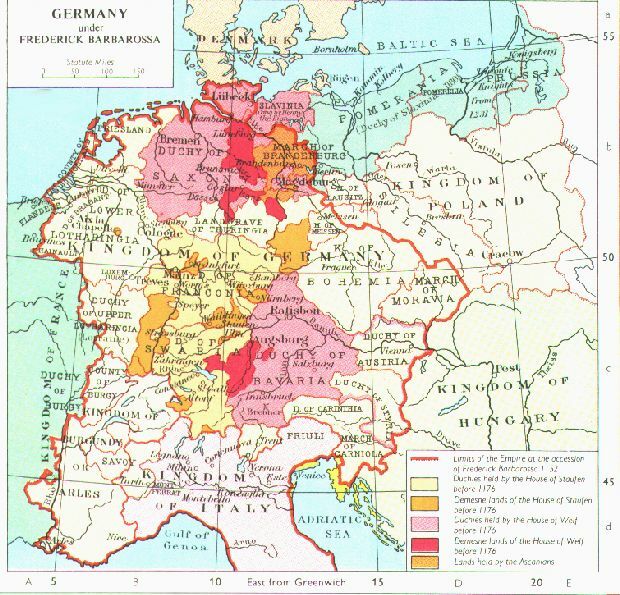 The German Confederation, 1815-1866 -- Available on Culture 4.0 CD-ROM. India in 1858 -- Available on Culture 4.0 CD-ROM. Central Europe, 1860 -- Available on Culture 4.0 CD-ROM. Acquisition of Territory by the United States -- Available on Culture 4.0 CD-ROM. Development of States in the United States -- Available on Culture 4.0 CD-ROM. South Eastern Europe, 1861 -- Available on Culture 4.0 CD-ROM. Europe after the Congress of Berlin (1878) -- Available on Culture 4.0 CD-ROM. 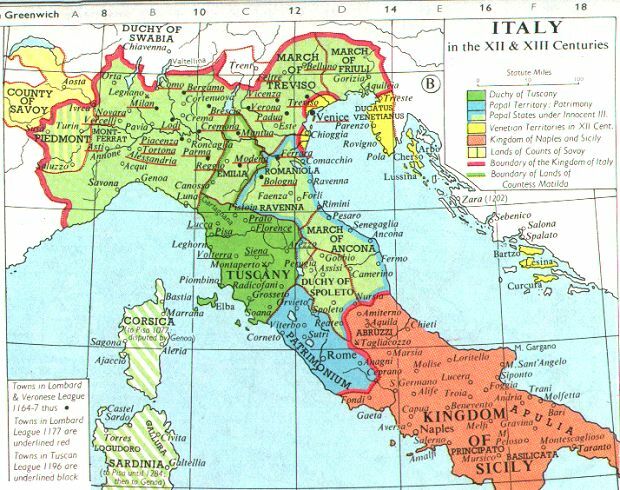 Italy in the XIX Century -- Available on Culture 4.0 CD-ROM. 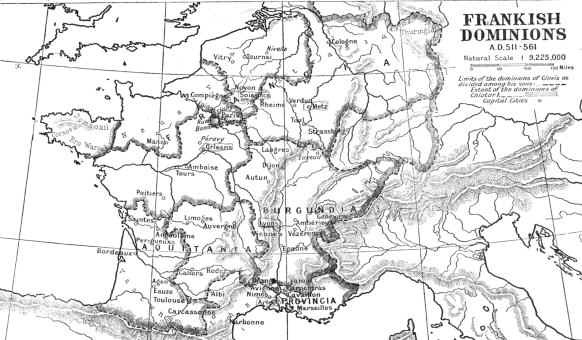 South Eastern Europe, 1881 -- Available on Culture 4.0 CD-ROM. 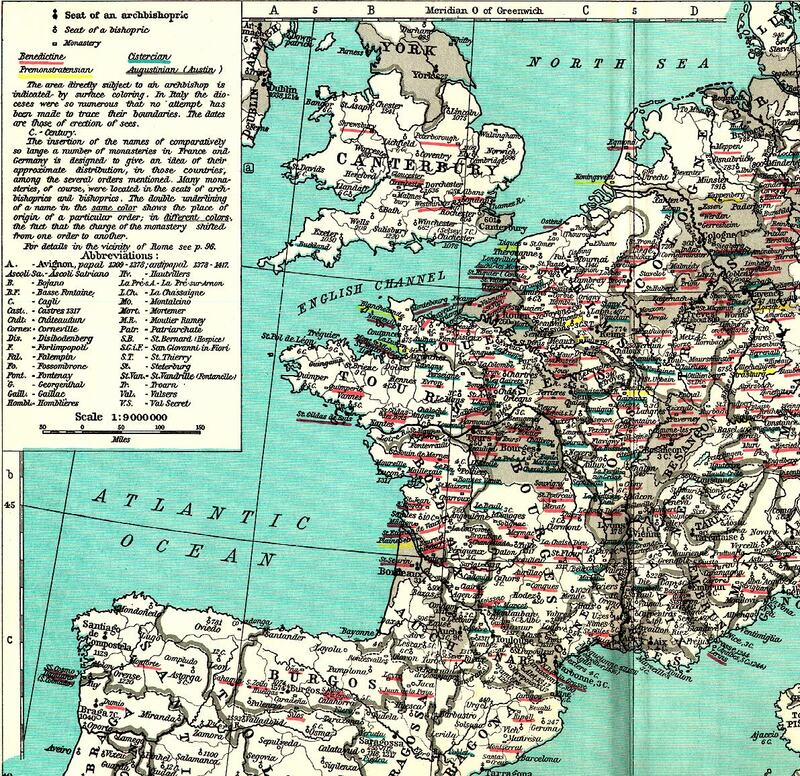 Selections from the European Map Collection (Atlas To Freeman's Historical Geography, 1903). Territorial Expansion of the United States : 1783-1853 -- Requires Shockwave plug-in (339K). United States after the Treaty of Paris : 1783 -- Requires Shockwave plug-in (161K). Native American Tribes: 1783 -- 76K. European Possessions Bordering the U.S. : 1783 -- 70K. Louisiana Purchase : 1800-1803 -- Requires Shockwave plug-in (145K). Journeys of Lewis & Clark : 1804-1806 -- Requires Shockwave plug-in (101K). Jackson's Campaigns in Florida: 1818 -- 41K. 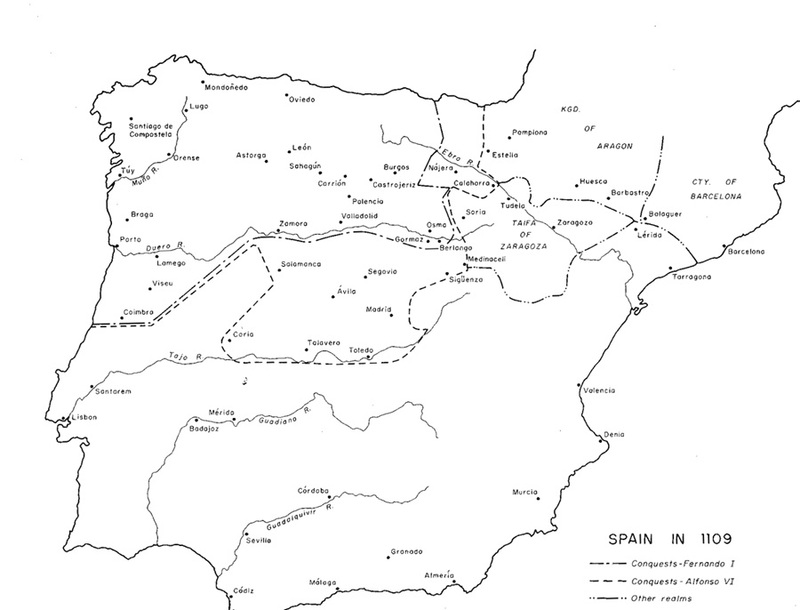 Territory ceded by Spain: from 1810 to 1819 -- Requires Shockwave plug-in (80K). Oregon Country: 1843-1848 -- Requires Shockwave plug-in (96K). The War with Mexico: 1823-1846 -- Requires Shockwave plug-in (132K). Mexican Cession: Political Boundaries -- Requires Shockwave plug-in (97K). Gadsden Purchase & Proposed Rail Routes : 1853 -- Requires Shockwave plug-in (88K). Alaska and Hawaii -- 64K. Status of Slavery in Original 13 States -- Requires Shockwave plug-in (106K). Cotton Production in the American South: 1790-1860 -- Requires Shockwave plug-in (149K). Slavery in the American South: 1790-1860 -- Requires Shockwave plug-in (244K). Slave Crops in the American South: 1860 -- 82K. The Missouri Compromise: 1820 -- Requires Shockwave plug-in (96K). Compromise of 1850: Status of Slavery -- Requires Shockwave plug-in (91K). Kansas-Nebraska Act: 1854 -- Requires Shockwave plug-in (90K). Exploring the West from Monticello: A perspective in maps from Columbus to Lewis and Clark (U. of Virginia) -- Includes dozens of historical maps and detailed commentary. Very well done. Borders of the Contiguous States (Ed Stephen) -- An animation showing the emerging American states. Napoleon's Empire, 1812 (HyperHistory) -- Interactive map with contextual links. United States 1823-1845 (Joaquín de Salas Vara de Rey) -- In color. Map Index (U.S. Civil War Center) -- An extensive list. Civil War Map Collection (University of Georgia) -- Several dozen maps are included in this collection. The Middle East in the Nineteenth Century (upenn) -- From W.C. Brice. An Historical Atlas of Islam (Leiden, 1981). 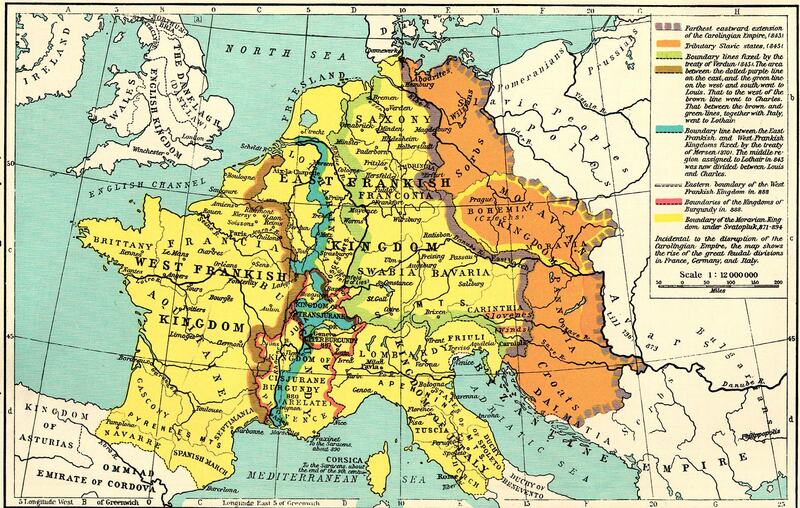 Europe in 1900 (Matthew White) -- Map with links to related maps; nicely done. Historical Atlas of the 20th Century (Matthew White) -- An interesting collection of historical maps and commentary providing an overview of the 20th Century. Well done. Soviet Union 1921-1929 (Joaquín de Salas Vara de Rey) -- In color. Map Machine (National Geographic) -- Access to hundreds of National Geographic maps. Current Political Maps from National Geographic (downloadable with links to physical and other maps). Atlapedia -- Contemporary maps and related info. 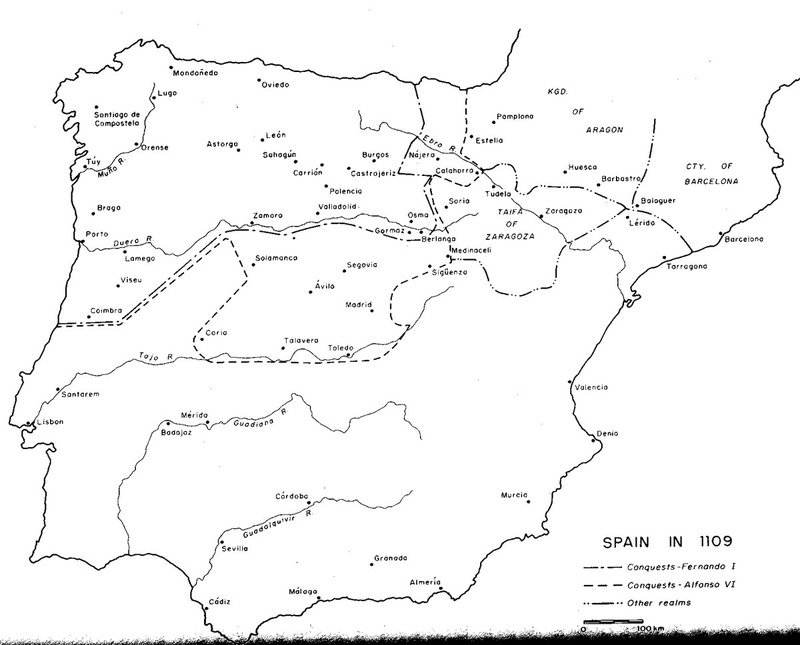 Map Room (Trenches on the Web) -- A collection of several dozen WWI maps. Treaty of Versailles (Steve Schoenherr) -- The complete text of the treaty as well as a nice collection of associated maps. World War II Maps (University of San Diego) -- An excellent archive; also available arranged chronologically. World War II Theaters (Indiana State University) -- Collection and commentary. Fascist Europe 1941-1945 (Joaquín de Salas Vara de Rey) -- In color. A Virtual Visit to Vietnam (Vietnam Veterans' Home Page) -- Includes maps. Europe, c.476 A.D. -- Available on Culture 4.0 CD-ROM. Europe, c.520 A.D. -- Available on Culture 4.0 CD-ROM. Europe, c.600 -- Available on Culture 4.0 CD-ROM. Europe, c.800 -- Available on Culture 4.0 CD-ROM.